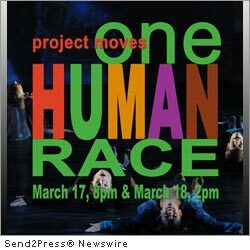 BROCKTON, Mass., Feb. 23, 2012 (SEND2PRESS NEWSWIRE) — Project Moves Dance Company, Inc., the resident company of The Gold School of Dance Art in Brockton, Mass., is proud to announce its inaugural season opener, “One Human Race.” Performances for One Human Race will be held March 17 and 18, 2012, at the Boston Center for the Arts, Stanford Calderwood Pavilion. Tickets are $32 General Admission and available at the company’s website, www.projectmoves.org. Sponsorship packages for the non-profit 501(c)3 company are also available through the website. Project Moves Dance Company, Inc. is dedicated to encouraging positivity, passion, and personal growth through movement and the art of dance. By advocating a message of acceptance and tolerance, the company is creating a platform that empowers young dance artists with the knowledge, compassion and understanding necessary to create works that address the most pressing issues of today’s youth, thus transforming the artists and their audiences alike. For more information, photos and video about the Project Moves Dance Company, Inc. please visit http://www.projectmoves.org . - 300dpi PHOTO download for media: Send2Press.com/mediaboom/12-0223-david_300dpi.jpg . - Photo Caption: “For Matt” Dedicated to Bullycide victim Matt Epling. Choreography: Rennie Gold. News Source: Project Moves Dance Company, Inc. :: This press release was issued on behalf of the news source by Send2Press® Newswire, a service of Neotrope®. View all current news at: http://Send2PressNewswire.com .